BRIGHTON Mich., - The 2012 Ford Focus ST is a big step into the future where you own a car that not only has new dual-clutch Six-Speed PowerShift Automatic Transmission, Torque Vectoring Control and AdvanceTrac ESC (Electronic Stability Control) with ABS (Anti-lock Brakes), it also has EPAS (Electronic Power Assist Steering). With Ford’s new Focus, comes the possibility that your life will become that much more safe, convenient, and exciting! The six-speed PowerShift automatic transmission makes changing gears more effortless than ever before. This car’s fuel-efficient design allows you to make good use of the excellent gear shifting abilities as well. SelectShift technology is also available for certain models, giving you the ability to change gears simply with the press of a button. According to Ford, the new Torque Vectoring Control system harnesses the traction transferred by G forces when taking a corner from the outside tires and shifts the torque to the most stable wheels. 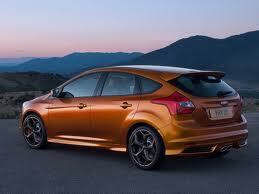 Meanwhile, the front of the Focus clings to the inside of every curve and basically renders understeer obsolete. Every Ford Focus has AdvanceTrac ESC with ABS, yet one still marvels at the ability of the technology to continuously survey the driver’s responses and road conditions then apply the ABS brakes and adjust engine power, in order to keep all four wheels securely on the ground. The EPAS’s Pull-Drift Compensation technology measures the steering input of the driver, compensates for steady crosswinds or uneven road surfaces and adjusts to the changing road conditions. You’ll be amazed by all of the bells and whistles this new Focus has to ensure that you have an intrepid life. Look for the perfect car for you in the Brighton Ford Inventory and if you have any questions or concerns then feel free to contact us!